The ECHL announced Tuesday that Fort Wayne center Thomas Frazee has been named the Sher-Wood Hockey ECHL Player of the Week for the week of Dec. 22-28. Frazee scored three goals and added two assists for five points in two games and extended his point-scoring streak to three games. 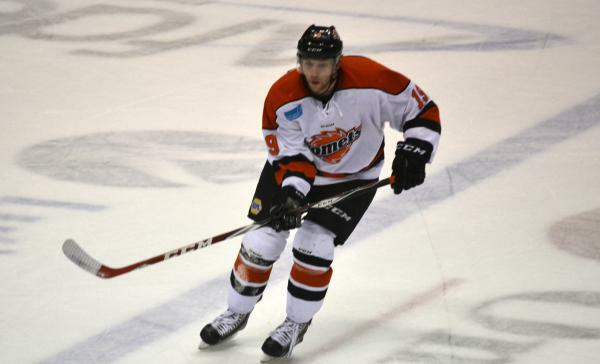 The North Vancouver, British Columbia native scored a pair of goals and an assist for a three-point night in a 6-4 setback at Evansville Friday before contributing a goal and an assist in the Komets' 5-1 home win over Evansville Saturday. Frazee is skating his second full pro season after appearing in 60 games with Quad City last year in the CHL. The skater also appeared in 13 games with Bakersfield in the ECHL during 2011-12. After 29 games with Fort Wayne this season the 24-year-old has scored 10 goals and 17 points. Frazee logged his 100th pro game Monday night in Fort Wayne against Quad City. I would think that fort wayne youth hockey has gotten a dump truck full of pucks this season.